Our liqueurs are more than an ingredient for a delicious cocktail. You can also make great desserts and cakes with our liqueur. On Curaçao, we are known for having a sweet tooth and adding a little bit of booze will only make our heart beat faster. 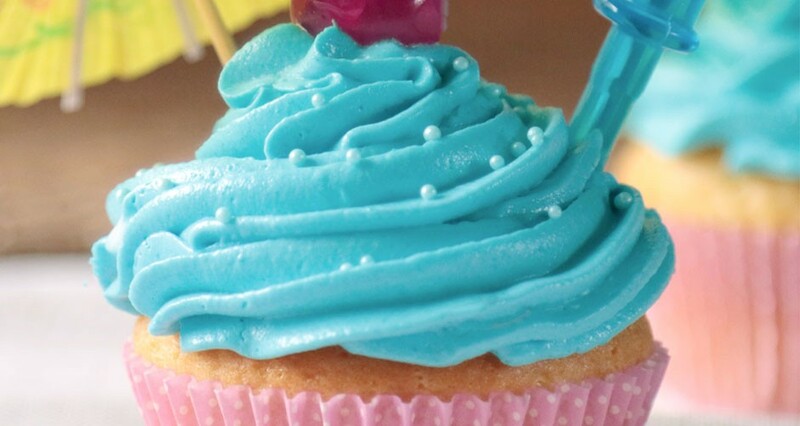 The perfect combination of cake and liqueur comes to life in our Senior's Blue Curaçao Cupcake. The Senior Blue Curaçao Cupcake is a fluffy cupcake infused with our Senior Blue Curaçao with a delicious fierce blue topping. The look of it is already a party! Can you imagine the taste of this cupcake? Jurino from Antiliaans Eten developed this recipe. On his Dutch food blog, he shares traditional (and modern) recipes from the Dutch-Caribbean cuisine. A blue cupcake made with the Senior Liqueur had to be part of it, of course. In a mixing bowl beat the butter with the sugar and vanilla sugar until it becomes creamy. Add the egg and the orange zest to the mixture. Sift the flour on top of the mixture and mix it all. Add the salt, orange peels, and the orange juice and mix it into a smooth batter. Place the cup liners in the baking pan and fill it to 2/3 with batter. Bake the cupcakes for 25-30 minutes or until you insert a toothpick in the center and it comes clean. Let it cool. For the frosting, mix the butter, Crisco, and icing sugar with an electric mixer to a fluffy mixture and until it doubles in size. Gently add the Senior Blue Curaçao, (if you choose to) the blue coloring and mix it for about 5 minutes. Frost your cupcake to your desire. Fill the pipette by sucking the Senior Blue Curaçao into it. Stick the pipette on the side of the cupcakes.